My brand new series is out and as you can see it’s called, Is It Really That Good? We look at different ‘Best Comic Books Ever’ lists and we see if the series is really that good. Today we are looking at a list composed by Marvel themselves called 75 GREATEST MARVEL COMICS OF ALL-TIME. I’ll include a link to the list towards the end of my discussion. I will be looking at numbers #75-#71. So the name says it all, but that doesn’t mean there aren’t any surprising moments in the comic. Brian Michael Bendis gets a lot of crap lately for writing cliche and predictable stories, but this would be a counter for that. 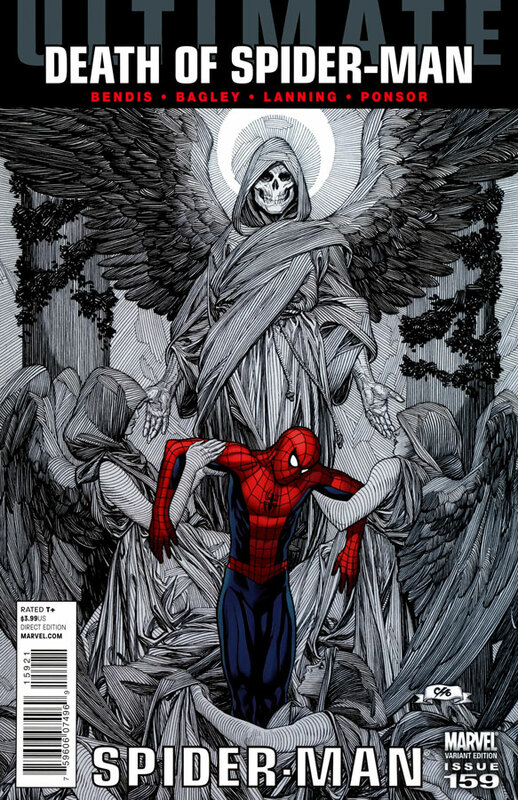 Taking place in the Ultimate Universe, back when Marvel still had alternative universes, Peter Parker fights his last days as Spider-Man. There are many great character moments in there and one scene even gave me chills! There is an homage to another death of a famous superhero and in my pinion this was done very well. Written by Warren Ellis, Nextwave: Agents of HATE was something very different for Marvel to do in its time. With great cast of characters that played off each other super well, Nextwave is something Marvel will probably never find alike. If you get your hands on it, read it because you’ll love it. It’s truly something you haven’t seen before. Very fun with a great twist at the end. Too bad Marvel cancelled it after 12 issues. The comic was being published around the same time as 2006’s Civil War which at the time every comic had to tie-in. This comic said, “Screw that!” and didn’t. Just look at that cover. How come Agents of SHIELD is a TV show, but this isn’t?! But please whatever you do, do not search up the comic’s cringy theme song on YouTube! You already searched it, didn’t you? Let’s be real here. The only reason this comic got on here was because it was the very first appearance of Deadpool. It really shouldn’t be on the ‘best’ list due to having not much going for it. “But you have to read the entire arc to understand it!! !😠”I actually read the entire arc to see if it’s any better, Angry Fanboy. Reading the entire story honestly made it worse for me plus, that shouldn’t be your argument since Marvel and fans chose particularly issue 98 to be on the list and not the entire story arc (I can see why). The comic was very slow and when something happened it felt like nothing major. I gotta admit it was nice seeing Deadpool in his first outing, but very different from what everyone knows him as. I can’t believe I am saying this, but I just had so much fun reading this story. This is an example of a single comic that manages to tell its own quick independent plot. A ‘Champion’ comes to Earth wanting to fight every strongest fighter in the world while the event streams EVERYWHERE for the Earthlings to watch. It sounds silly, it is silly, but you do wanna read it because you’re so curious of what will happen. It knew it was a fun comic so that’s what it was. Highly recommend for everyone. A very non-action packed issue, but you should still probably wanna read it. Another single issue that deserves to be on here. Exposition is this: Reed Richards saves Galactus’ life, then Galactus kills a world and now Reed is on the galactic trial to answer for his crimes! There is a little…. don’t wanna call it a twist, it’s something that adds to your experience. I was glad this type of comic earned its right on the list. Crazy things happen despite of it being just about a trial. Written by John Byrne. Why am I telling you his name? Just remember it before reading. Next time we’ll look at numbers #70 to #66.